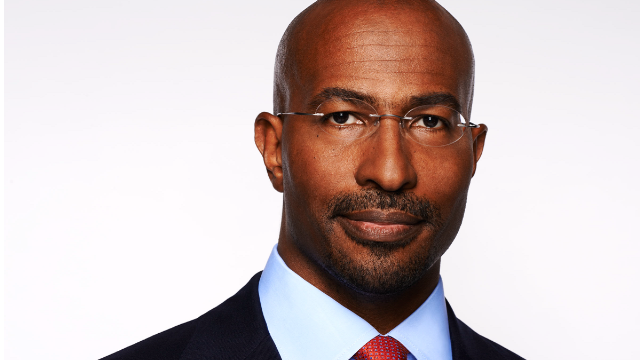 Van Jones is a host of Crossfire, which airs weeknights at 6:30pm ET on CNN. Jones has founded and led four not-for-profit organizations engaged in social and environmental justice including, Rebuild the Dream, that promotes innovative policy solutions for the U.S. economy; the Ella Baker Center for Human Rights that focuses on economic empowerment and skills training in California; Color of Change, that offers training and guidance on issues related to racial equality and fairness on behalf of communities of color; and Green for All, dedicated to jobs training in the green sector with the goal to help lift people out of poverty. Jones is also a senior fellow with the Center for American Progress and focuses on policy matters related to green jobs and how cities are implementing job-creating climate solutions. Jones is a Yale-educated attorney and author of two New York Times best-selling books, The Green Collar Economy (2008) and Rebuild the Dream (2012), about his journey as an environmental and human rights activist to becoming a White House policy adviser. He was the main advocate for the Green Jobs Act. Signed into law by George W. Bush in 2007, the Green Jobs Act was the first piece of federal legislation to codify the term “green jobs.” During the Obama Administration, the legislation has resulted in $500 million in national funding for green jobs training. In 2009, Jones worked as the green jobs adviser to President Barack Obama. In this role, he helped to lead the inter-agency process that oversaw the multi-billion dollar investment in skills training and jobs development within the environmental and green energy sectors. Follow Van on Twitter, Facebook and Instagram. See more from Van Jones on Crossfire.